This week’s object of the week has been chosen by Shaldon Primary School. Following one of our education workshops they chose the boy mummy ‘Psamtek Ankh’ as their most favourite artefact in the museum. Psamtek Ankh means “May Psamtek live again”. 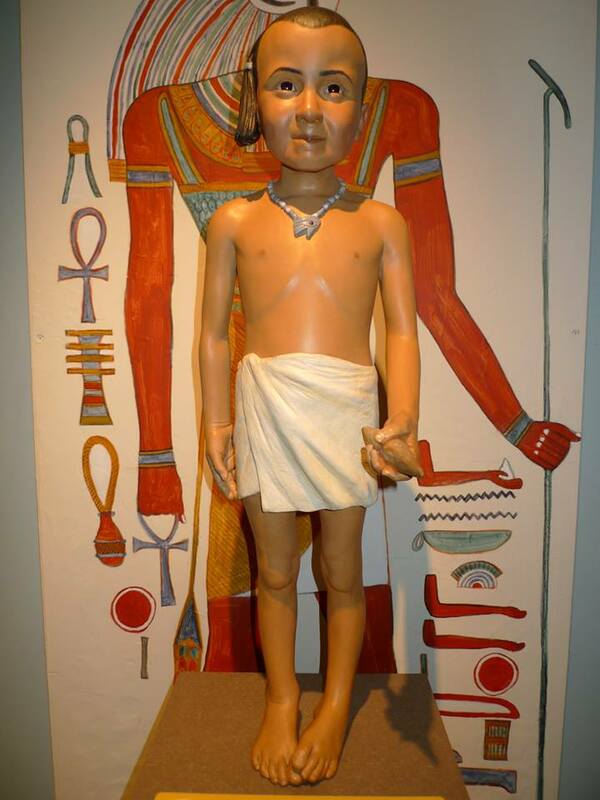 It is the name we have given to this young boy who lived in Egypt over two thousand years ago in about 600 BC. He has his very own coffin complete with inscription dating to the New Kingdom, which we are proud to say is one of the finest coffins to be found in any regional Museum throughout the UK. The children learned that the mummy has been scanned and x-rayed to determine that he is thought to be between 2 and 4 years old. There is also clear evidence of the mummification technique used and this has helped to create a reconstruction which now stands opposite him in the Explorers and Egyptology Gallery. Psamtek is a very important little boy indeed. Recent research on his coffin has shown it was from a very high status family from the early 18th Dynasty. Before Psamtek the previous occupant may have been a Royal child.